FILE - Italy's former Prime Minister Silvio Berlusconi is seen during the television talk show "L'aria che tira" in Rome, Jan. 18, 2018. His political obituary has been written many times over but Silvio Berlusconi is set once again to become the grand ringmaster of Italian politics. But he will have to contend with Matteo Salvini, whose anti-migrant, euro-skeptic Lega party is in a rightwing electoral alliance with Berlusconi’s party, Forza Italia. Salvini is vying for the top job as prime minister and he’s unlikely, say insiders, to follow instructions meekly from the 81-year-old Berlusconi. The alliance, which includes Fratelli d'Italia (Brothers of Italy), is likely to emerge as the largest political force in parliamentary elections Sunday and it may secure sufficient seats to form a majority government — or at least be close enough to be able to woo defectors from the ranks of rival parties with promises of government posts, say analysts. And the Lega’s bellicose talk is seemingly helping it make inroads in the south of the country — a remarkable achievement for what was once a secessionist northern party that disparaged southerners as parasites. Italian Northern League supporters hold flares as they arrive at political rally led by leader Matteo Salvini, in Milan, Italy, Feb. 24, 2018. Salvini has made no secret of his ambition to be Italy’s next prime minister and replace left-wing Prime Minister Paolo Gentiloni, whose Democratic Party looks set to secure less than 20 percent of the vote on Sunday. And if Salvini’s party can secure more seats than Forza Italia on March 4, even the master political manipulator Berlusconi himself will struggle to block him or control him, analysts predict. FILE - Forza Italia leader Silvio Berlusconi gestures during EPP European People's Party meeting in Fiuggi, Italy, Sept. 17, 2017. How the personal relationship will unfold between the octogenarian television and property magnate, who left office in disgrace, and his 44-year-old supposed election ally, a friend of France’s National Front leader Marine Le Pen and Belgium’s populist Geert Wilders, could well dictate the fate of Italian politics for years to come. Italian politics is nothing if not operatic. Cast members, driven by personal animosities and ambition, all too often stray from agreed scripts as they seek the limelight. And the signs are that Berlusconi and Salvini just don’t like each other, avoid socializing and may be heading for a political collision later that could upend the agreed script of right-wing triumph. On the campaign trail, Berlusconi, who was once seen, especially in Brussels, as a possible moderating force on the more iconoclastic Salvini, has, with the exception of the EU, been keen to match the younger man in terms of tough talk, especially when it comes to what should be done with migrants, the key issue of this election, and one that has distracted from any serious public debate about Italy’s fundamental problems of low growth, high unemployment and a bloated, and often inefficient, public bureaucracy. Last week, during a show on Rome’s Radio Capital, Berlusconi, who is banned from holding office until 2019 because of a tax fraud conviction, dryly commented, “Salvini is sometimes a little pyrotechnical.” He offered a meek defense of the firebrand Salvini when the interviewer accused the Lega leader of violent rhetoric, suggesting that he could be more bellicose than he should, but that the maverick Five Star Movement was worse. FILE - Italian former Prime Minister Silvio Berlusconi is welcomed by EU Parliament President Antonio Tajani, at the European Parliament in Strasbourg, France, July 1, 2017. Berlusconi is keen to maneuver into Palazzo Chigi, the prime minister’s residence, someone who will give way to him when his ban expires in 2019 and has been advocating for the job Antonio Tajani, the current president of the European Parliament, who served as Berlusconi’s spokesmen during his first administration. 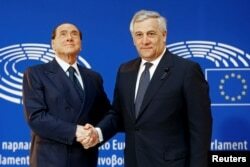 “He is a good candidate, he could assert Italy's interests in the EU. 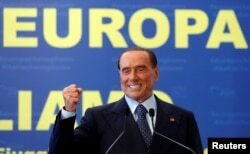 We need a stable Italy and we need a friendly Europe,” Berlusconi said. 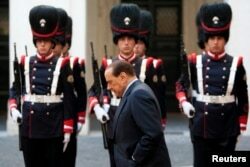 FILE - Then-Italian Prime Minister Silvio Berlusconi walks before a meeting at Palazzo Chigi in Rome, Nov. 13, 2009. Few predicted he would forge an improbable political comeback, one that’s enraged his foes and delighted his followers. He is appealing his ban from public office and a European court is currently reviewing it. Berlusconi nonchalantly dismisses any interest in whether the court finds in his favor or not, saying last week in a broadcast interview, “me ne frego" [I do not care]. He accompanied the remark with a characteristic hand gesture of disdain, flicking the fingers under his chin with the back of his hand to his interviewer. The comment was vintage Berlusconi. It was carefully calibrated to appeal to Salvini’s followers, many who have their roots in Italian Neo-Fascism, and to boost Forza Italia’s vote at the expense of its election partner, the Lega. The phrase is associated with the warrior-poet Gabriele d’Annunzio, became popular with front line Italian soldiers in World War I as an expression of bravado and was adopted as a motto by Benito Mussolini's Black Shirts and squadristi. 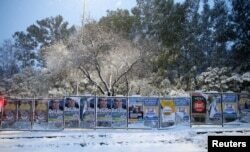 Electoral posters are seen during a heavy snowfall in Rome, Feb, 26, 2018. On the campaign trail, Berlusconi, who was once seen, especially in Brussels, as a possible moderating force on the more iconoclastic Salvini, has, with the exception of the EU, been keen to match the younger man in terms of tour talk, especially when it comes to what should be done with migrants, the key issue of this election, and one that has distracted from any serious public debate about Italy’s fundamental problems of low growth, high unemployment and a bloated, and often inefficient, public bureaucracy. Berlusconi has played down any presidential ambitions, saying he doesn’t plan on running for the head of state’s job later.